Please see Calendar for upcoming course dates. Rescue Diver is $399.00 plus HST. 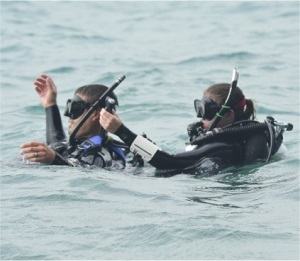 Diver must have all personal gear. To register students must come to the dive shop to fill out the appropriate paper work and pay in full for their course. Once you have registered you can pick up your textbook to start preparing for your course. Once you have registered you can pick up your Student Kit and take your first step toward learning to scuba dive. All students must complete the medical questionnaire. Please note: only if you answer YES to any of the medical questions do you require a signed Physician's form prior to taking the course. Medical Form. Please contact us if your require further information or wish to register for our course. Register Here. Rescue Diver will expand your knowledge and experience beyond the purely recreational level. You will learn to look beyond yourself and consider the safety and well being of other divers. Rescue Diver training will prepare you to recognize the signs and symptoms of problems before they occur, and if necessay, manage dive emergencies. Note: CPROX, CPR1st or CPROX 1stAED courses may be combined with the rescue program. At the successful completion of the course you will obtain a Rescue Diver Certification. You are now qualified to act as Safety Diver in other training courses and diver outings, under the supervision of an Instructor. All course fees are 100% non refundable and valid for one year. In the unlikely event you have to reschedule your scheduled pool sessions or evaluation dives, schedule changes are allowed up to seven (7) days prior. Within seven (7) days a rescheduling fee of $25.00 will be charged. Some exceptions may apply. Refunds will ONLY be made if a student withdraws from a course prior to the course start date due to medical reasons, substantiated by a signed medical certificate an administrative fee of $50.00 will apply. If a student withdraws from a course once the course has started no refunds are given – no exceptions.